Accelerating UI development with Crank Software and Embedded Artists. 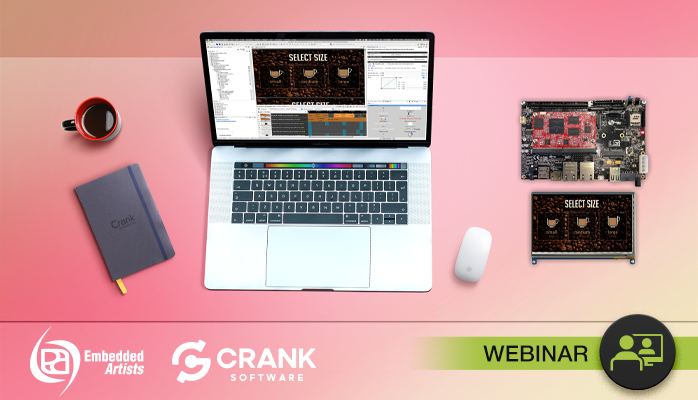 Join Crank Software and Embedded Artists to learn how to bring designers and developers together on low-risk, low-cost hardware using Crank Storyboard on NXP i.MX 7-based computer-on-modules (COM). With increasing demand for rich, engaging user interfaces (UI) across a variety of applications, finding ways to simplify development and accelerate time to market helps your products stand out against the competition. By keeping designers engaged and developers in control, working together on high-performance, low-power systems, you can deliver incredible user experiences that satisfy all your user scenarios and cost targets. Join Crank Software and Embedded Artists to learn how to bring designers and developers together on low-risk, low-cost hardware using Storyboard on NXP i.MX series-based computer-on-modules (COM). Crank Software will share features in Storyboard that support ease-of-use for designers and simplify the challenge of inevitable design churn and iteration. This includes design import and re-import from Adobe Photoshop, creating vibrant animations via the built-in timeline, and seeing how to quickly deploy and debug your app on real embedded hardware. Embedded Artists will explain how their COM boards and display adapter solutions accelerate development across display types and resolutions, making it easy to focus on your core business and deliver applications faster.